Bergen harbour is the backdrop for a perfectly remembered moment. 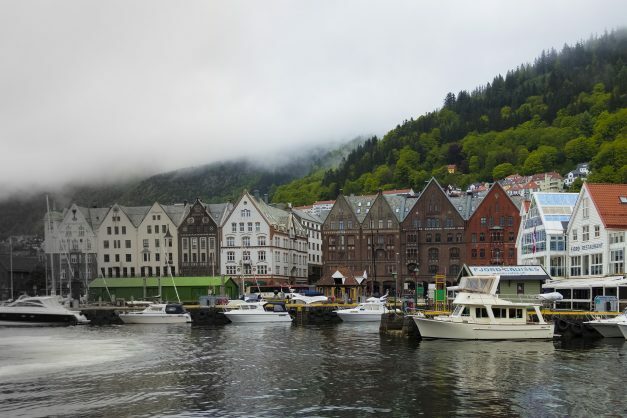 The port in Bergen is just what you want a Scandinavian harbour to look like. Small and clustered with stalls selling everything from cheese to enormous Barents sea crabs, the cobbled walkways lead, on the eastern side, to the UNESCO World Heritage site, the Hanseatic wharf. The Hanseatic League dominated trade in Northern Europe for 400 years and the wooden buildings that made up the offices and warehouses are bunched closely together, an ever-present threat of fire that clearly makes modern Norwegians nervous. My wife and I visited in September, just weeks before she found out she was pregnant with our son. On the evening before we took a small bus up into the Fjords we wandered the wharf, searching for dinner, filled with early holiday excitement. Despite the fact that it was still late summer, the sky was densely overcast with grey clouds and the wind was icy, blowing off the royal blue sea in a way that our South African jackets were never designed to cope with. Looking back I vaguely recall the historic buildings, the twisting wooden alleyways that lead between stores stocked with tourist memorabilia and the white-walled houses dotted amongst the dark green forests on the hillside, but I do remember our dinner. We bought fish and chips and sat with the boxes on a bench, under a heavy sky looking out over the harbour. In my memory time seems to slow. I can smell the vinegar on the chips, and see the steam curl away off the food in lazy circles. I recall my wife’s smile and the way the breeze flicked her hair such that she had to brush it behind her ear with almost every bite. A sailing boat in front of us bobbed, creaking on the water, small waves slapping the hull, while the people on board offloaded wooden crates. It all felt impossibly like a scene from a movie, this simple moment, at a time when I had just left a job that was making me unhappy, and the world seemed poised on the edge of significance. That week we spent hiking up in the Fjords, with mesmeric views across cliff-sided inlets, picnics in deathly silent meadows, and a snowball fight at the summit of a mountain, but it’s that dinner I remember most clearly. We’re divorced now, my wife and I, and that moment is a singular, landscape image. A pure, beautiful reminder of what it all really was.